In 2000, Laura Finn approached Bat Conservation International (BCI) about the need for a new program for ‘nuisance bats’ and the Bats in Buildings Project (BIB) was born. The BIB began as a cooperative effort between BCI & Fly By Night, Inc. — the goals were to provide an accurate source of information on issues related to urban bats and bats in buildings. BCI’s web site includes a detailed BIB page (coauthored by Laura with Barbara French & Mark Kiser) with information for homeowners & a certification program for professionals who agree to use only BCI approved exclusion methods. Laura was the program founder & remained active as the project coordinator until 2005. The BIB website includes a list of professionals who agree to use only approved methods. We can’t guarantee they all do, only that they claim to. So an interview is still a good idea. Too many companies continue to use outdated methods & scare tactics — please help prevent mortality caused by illegal or improper ‘control’ methods report unscrupulous professionals to the appropriate state agency & BCI. 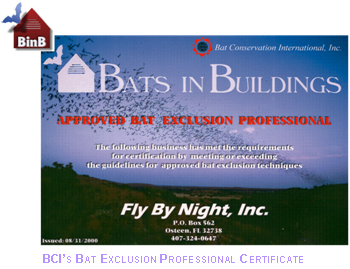 Our work with BCI’s Bats in Buildings Program has been a success, updated materials & information are available on BCI’s web site, and several states now required BCI certification for pest control & nuisance wildlife professionals that offer bat exclusions. But, misinformation remains abundant, even among some professionals who find the old ways easier. Much of the information found on official web sites is outdated or misleading Attempts to revise and update public information materials regarding bat exclusion and bat houses continues.